Students from Madison-area high schools stood up and walked out of their classes Wednesday afternoon, joining a mass of University of Wisconsin students, politicians, activists and advocates on the steps of the state Capitol to demand gun reform. Madison’s demonstration was one example of numerous walkouts organized by a network of high schools across the United States as part of National School Walkout Day — a day of protest created by the survivors of the Stoneman Douglas High School shooting which killed 17 students and teachers on February 14. An estimated 3,000 students marched from Madison East High School to the State Capitol, according to a Madison Police Department incident report. While there was some traffic delay, the protests were peaceful. 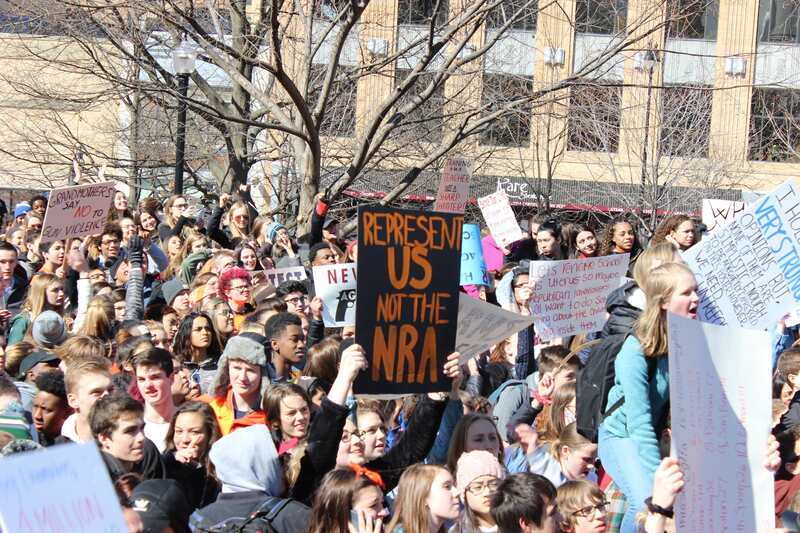 Students from La Follette, West, Memorial, East and other high schools — as well as some middle and elementary schools — congregated on the lawn of East High School around 11:30 a.m.
For over an hour and a half, students, activists and politicians delivered speeches down the steps of the Capitol to an audience almost entirely of young people. High school student Maggie Murray told the crowd about how she learned the correct way to respond to a school shooting — at five years old. If the gunman was at close-range, Murray’s mom instructed her to duck to the ground. If the gunman was far away, she should zig-zag. La Follette High School junior and organizer of the event Dija Manly said the threat of gun violence and mass shootings is real for students in every high school. 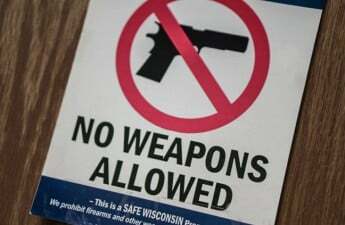 On February 22, for instance, a student at La Follette brought a loaded pistol to school. 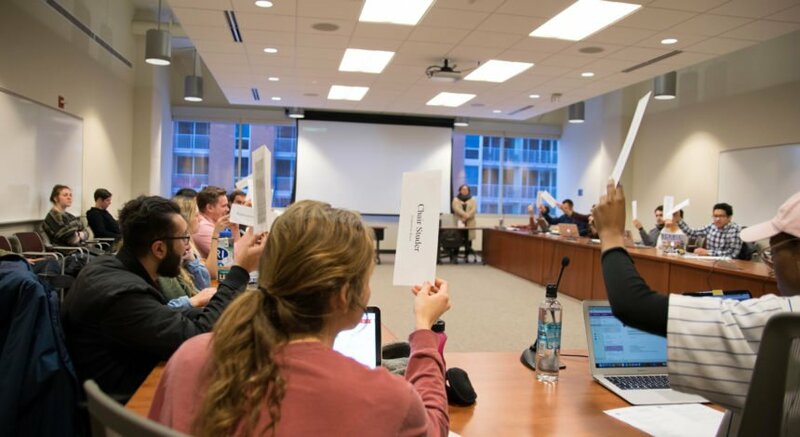 Politicians are at fault for not stopping gun violence — which is more prevalent in America than in any other developed country and disproportionately affects people of color, Manly said. According to a recent study compiled by Everytown Research, 96 Americans are killed with guns each day, and seven of these deaths are teenagers or children. The walk-out, protest and rally were organized almost entirely by high school students, who stood out in the crowd by their bright neon-orange shirts and megaphones. Students also drafted and delivered to Gov. Scott Walker — who was not at the event — a letter demanding five reforms: Universal background checks for purchasing a firearm, banning bump stocks, limiting magazine capacity, raising the minimum age to purchase an assault rifle or firearm to 21 and making education and training more accessible. State Rep. JoCasta Zamarripa, D-Milwaukee, encouraged the crowd to continue pressuring people like Walker and sustain the fight for gun reform. Democratic candidate for governor Kelda Roys said she felt excited about the activism shown in young people and assured them Walker, who has taken $3.5 million in NRA money, will feel their pressure come elections in November. 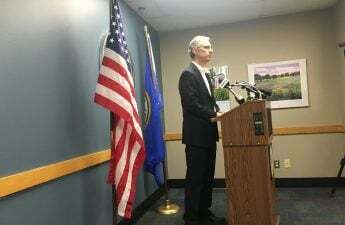 Dane County Executive Joe Parisi said in a statement emailed to The Badger Herald he will “once again” ask Walker and U.S. Rep. Paul Ryan, R-Janesville, to pass meaningful gun reform. Chloe Baumbach, a senior at Memorial High School, implored the crowd to vote, call local representatives and educate others on the issue of gun violence. Murray said those opposed to the rally think young people are vapid, ignorant of politics and shouldn’t lead a discussion on a serious issue like gun reform.